Halloween is a fun time of year, but it's important to stay safe if you are out doing tricks or treats, or just staying home and carving pumpkins with your friends. Here are some cool Halloween games that you can play any time of the year. Hopefully they will make Halloween less scary and more safe for you. Grab a mug of hot cider and play with us! Play this fun Halloween game with Mario and his friends. Help Dr. Strangemitten in his plan of introducing nougat filled Shrunken Heads for a Halloween Treat. Come play against the Black Dragon in this Shanghi Game. Destroy the evil pumpkins by smashing them together. Help the Headless Horseman stop the Evil Scarecrow from smashing all the pumpkin heads. 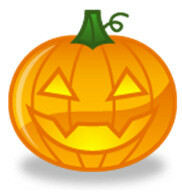 Scary Platform game with bouncing pumpkin head.